Spencer Hawes-C-76ers- With the stunning addition of ex-Laker Andrew Bynum in the off-season, Hawes will move over to Power Foward full-time. His nice mid-range shooting makes him a perfect fit in this front court. Playing just around 25 minutes a game last season, the 7 footer garnered 7.3 rebounds and 1.3 blocks a game; numbers which are sure to improve into the 12.5/8.5/1.75 range as the starting PF. Nicholas Batum-F/G-Trail Blazers- This talented 23 year old has improved every year since coming into the league after playing in France in the ’07-’08 season. Expected to take on a larger role this year, Batum, who can fill the majority of a stat sheet in almost every category, is destined to have a breakout ’12-’13 season. We project him to finish with around 17 points, 5 boards, 2 threes, 1 steal and 1 block per game. He should be picked up in the 2nd -3rd round. 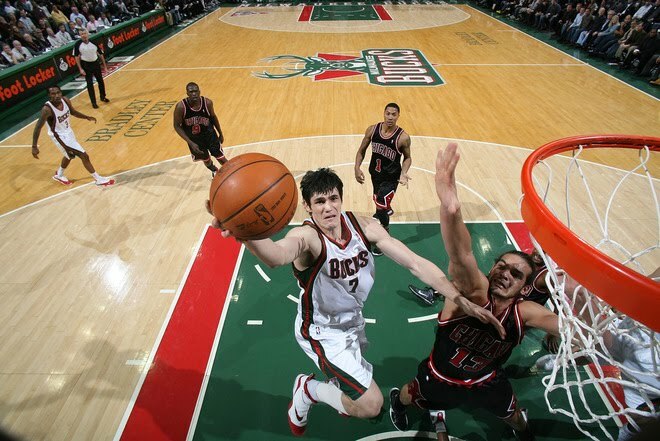 Ersan Ilyasova- F-Bucks- Now entering his fourth year with the Bucks, the 6′ 9″ forward takes over the starting role and should see his numbers, which skyrocketed after the All-Star break last season, ascend nicely from last year. Somewhat of a poor man’s David Lee with 15/9-15/10 a night. Plus he will put up an occasional three and his very good FG and FT percentages make him a solid mid-round pick. Jeff Teague-G-Hawks- Even with the addition of Devin Harris, the loss of Joe Johnson to Brooklyn will turn Teague into a more traditional PG and his numbers should surge. He is another candidate for a breakout year; something like 17 points, 5.5 assists, 1.5 steals and 1 three per game would not be that out of line for the 24 year old in his fourth year with Atlanta. Danny Ferry, Hawks GM is really high on this kid and with Smith and Horford as the only other true scorers on the team, we look to Teague for boosts in points & assists. He’ll make for a solid 3rd round pick. 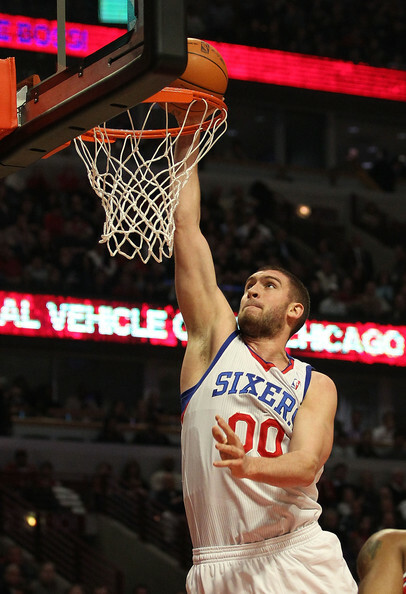 Jonas Valanciunas-C/F-Raptors- Probably the second best rookie in the league this year, we’re touting the big guy from Lithuania because he can bang the boards with the best of them and will work well along side Andrea Bargnani. For those of you who are familiar with Bargnani, he is a bit injury prone (his calf is healed now) and should he miss any time on the floor, Valanciunas would pick up the slack. We see the rookie turning in 8-10 points & 8-9 rebounds with a couple of blocks a game. 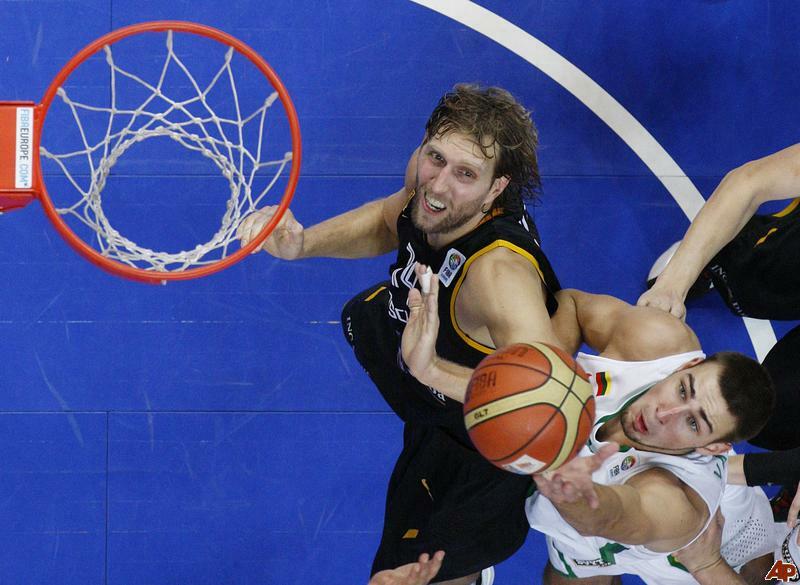 His free throw shooting is typical for a European player so you won’t lose out with that category either. Consider him a low risk-high reward pickup somewhere in the later middle rounds. In deeper leagues he’ll make a serviceable second center. Keep your eyes on him this year as he might even average a double-double by season’s end. Mo Williams-G-Jazz- With the aforementioned Devin Harris gone, Mo will be the starting floor general once again like he did so successfully in Cleveland where in his first three years there he amassed 17.8/4.1, 15.8/5.3, and 14.0/6.6. His numbers should rival those for the most part, but Williams also brings at least 2 threes and one steal a night and is close to being a career 90% free-throw shooter. With Al Jefferson and Paul MIlsap to feed the ball to, we think they’ll be a rise in his assists and threes (he’ll be their best three point shooter on the floor). A can’t lose mid-round pickup for your second PG. Kawhi Leonard-F-Spurs- Leonard, a great draft choice of the Spurs in 2011, can do almost everything on the floor and with his extra time at the three this year his numbers should and will spike across the board. He can rebound, get you steals and knock down a nice amount of threes, filling your stat sheet rather nicely for a late mid-round pick (around the 5th-6th rounds). With the veterans on the Spurs needing as much time off during the regular season, expect Leonard’s minutes to increase from 24 last year to around 30. His FG% and FT% is more than adequate as well. The second year forward is a major sleeper candidate for us. All great choices but what of their leadership abilities ? Dropped this on the Celtics and Red Sox , if at all interested ? In fantasy sports no cares about leadership qualities. They just want their team to garner the most points every week..
Read your articles. Not into boxing anymore. Nothing interests me and (apparently most people) like it used to years ago. If you ask ten people who the holds championship titles in all the weight classifications they would look at you like you had three heads and appear like a deer in headlights.. I like Hawes as well and Stucky is a great choice as well, nice work! Thanks! Were you able to pick either of them up in your draft? I was able to get Stucky, but im in need of a back up center and mybe later going to pickup for Hawes, right now he is a FA. A couple of good pieces on the NBA! Always a great bit of insights to be had. I gotta get my “NBA” on soon, the season’s here already. Any comment on the winless Lakers? As for the Lakers, I never lent much credence into pre-season games in any sport so I really don’t have much of a take on the winless streak in L.A. I am sure that when the games mean something it will be quite a different story. What I AM most interested in seeing is the dynamic between Nash & Kobe. One’s a facilitator and the other is an ISO man who constantly demands the ball. We’ll see how that plays out soon enough with the regular season starting on Tuesday. Thanks for checking in and if I am behind on reading any of your articles, please forgive me as I’m over my head with pieces being worked on.